As we close in our 10,000th SocialAdr member, we want to do something special. After all, that’s a pretty big milestone. And what better way to celebrate than to give away credits? So, from now until we reach our 10,000th member, YOU, our existing members and affiliates, have a shot at winning major credits for free. Read more about the contest details here. So how does this benefit YOU? Because the person that refers a member gets the same bonus that they do! 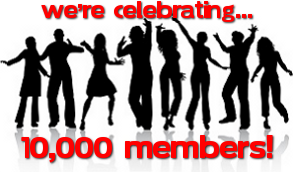 So if you refer the 9500th member, you also get 9,500 credits free. And if you are lucky enough to refer our 10,000th member, not only do you get the 10k free credits, you also will have your current account comped for life. Not too shabby, huh? So head on over to the special page in our affiliate section where you can find banners, links, and pre-written email(s) to send to your list.